I am a weaver who first sat down at a loom in 1983 and have been on a learning odyssey ever since. My favorite pastime is designing new pieces and playing with colors, sometimes dyeing my own yarns. I make cloth that industry can’t produce. I prefer to work with natural fibers such as cotton, wool, silk and rayon. Why shouldn’t functional household items also be beautiful and bring pleasure to the user? Math plays a big part in weaving and I like to take it to a higher level by using the Fibonacci sequence in many of my designs. 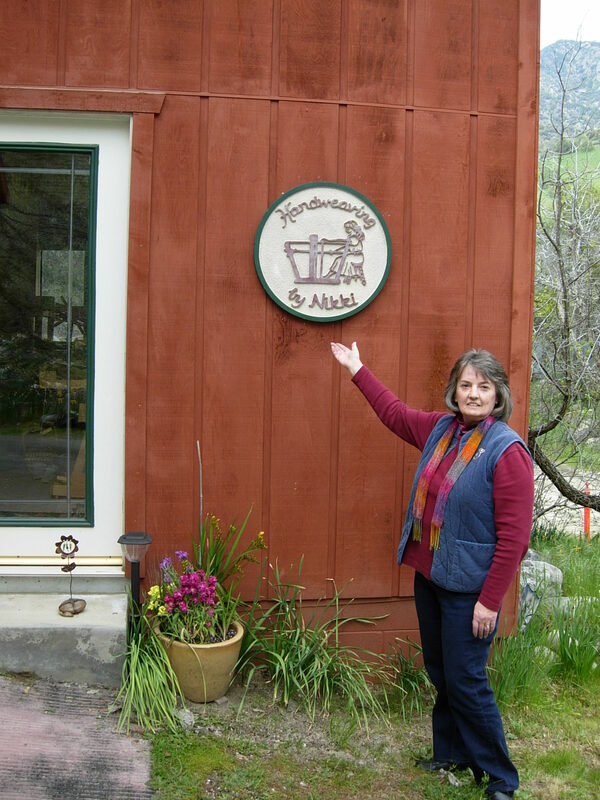 My studio is located in Three Rivers, California along the South Fork of the Kaweah River. There are 6 looms in operation in my studio with 2 more in the house and another in the garage. The studio is open by appointment where you can watch me make scarves, shawls, throws, towels, placemats and other personal and household items. Private weaving lessons can also be arranged. If you contact me and let me know you are coming, I’ll give you directions to my studio. Here I am at my happiest, at a loom in the studio. If you are interested in purchasing any of my weaving, contact me in a comment on this site or by email at weave@gotsky.com. I like your towells, especially the one with the pine trees as s banner. Is your work sold in shops in three rivers, or at shows? Thank you for your kind words about my weaving. The piece with the trees is not recommended to be used as a towel because the back of the design has long “floats” which may catch your fingers or jewelry. It is meant to be a table runner. I don’t have any right now but I do take orders. My work is available at Anne Lang’s Emporium in Three Rivers and the E Street Market in Exeter. I often have my studio open on 1st Saturday In Three Rivers and I attend many of the shows in the Three Rivers area. Please check my Events page which I am currently updating.